Indian monuments serve as the repository of its rich past and legacy. Get to know about the famous monuments in India. 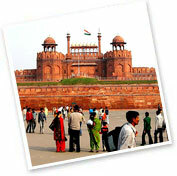 The symbol of Mughal prowess, might and supremacy, the Red Fort was built by the Mughal Emperor Shah Jahan. The fort comprises of a number of structures like Diwan-i-am, Diwan-i-khas, palaces, private apartments, Moti Masjid etc. A perfect blend of Rajput-Mughal architecture, the Hawa Mahal or the Palace of Wind is one of the main landmarks of Jaipur, the capital of Rajasthan. 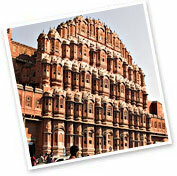 The Hawa Mahal is a five storey building of red and pink sandstone, beautifully outlined with white borders and motif's done with quick lime. The rich historical past and architectural past of India has resulted in the country being full of historical monuments. Especially its royal past and the colonial rule has ensured that it has so many monuments that you will tire from visiting all of them, but will never fall short of them. Infact, Delhi, the capital of India, boasts of so many monuments that you cannot possibly think of covering all of them in a single visit. Right from forts to tombs to towers to other magnificent edifices (like India Gate), the city has it all. Then, we have the state of Rajasthan, in which almost every city has a fort or a palace to be proud of. The Shekhawati region in the state is known for housing some of the most magnificent havelis (mansions) in the entire country. The architectural beauty of these monuments is enough to make you want to come again. When talking about Indian monuments, how can one forget the famous, the breathtaking and the awesome monument of love, which we know as the 'Taj Mahal'? Many tourists come to the country to visit this architectural wonder of the world only. Go to south and you will be greeted by the Dravidian architectural style, which can be seen in its forts, temples, palaces, etc. The monuments in India, just like its people, belong to different religions. We have Hindu palaces, Muslim forts, Christian churches, Jewish synagogues and Buddhist stupas. Almost every monument in the country has a tale attached to it, which speaks volumes about the courage, valor, heroism and chivalry of its founders. A trip to India, without visiting its monuments, is incomplete.